Thai Kingdom ,land of the free was know as “Siam” until May 11,1949 .The word Thai means “freedom” in Thai language and is also the name of the majority Thai ethnic group.It is the only Southeast Asian Country never to have been colonized by western power.Thailand is a constitutional monarchy and the king is extremely respected. The Thai king recently celebrated 60 years on the throne. Thailand located in The Southeast Asian on the gulf Thailand ,The Andaman Sea and covering an area of 513,115 sq.km and shares boundaries with Myanmar on the west and Northwest, Laos on the east and Northeast,Cambodia on the Southeast and Malaysia on the South. Thailand is divided into four natural regionsNorth is a mountainous region comprising natural forest. 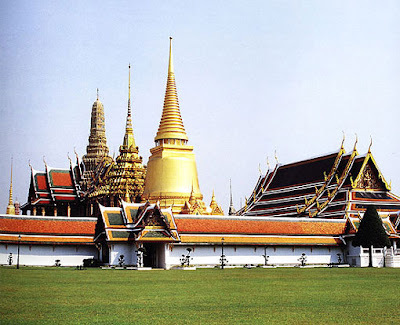 Central Thailand is the basin of the Chao Phraya river. It is the richest and most extensive rice producing area in the country and has often been called the “Rice Bowl of Asia” Northeast region is known as “Isan”. The Northeast is a hug region with over 20 millions inhabitants; the most of them are engaged in agriculture.Southern region is hilly to mountainous with thick forest and rich deposits of mineral and ores. This region is the centre for the production of rubber. The South’s wealth has been based for centuries on its rubber and industries. approximately 64,233,001 million (2005). The population includes 75% Thai, 11% Chainese,3.5% Malays and also Mon,Khmer,Lao,Karen minorities,Vietnames,Indian and others. The national religion is the professed faith of94.6 percent of the population.Theravada Buddhism is the state religion.Practically all-Thai males enter monkhood once in their lifetime to study the teachings of Lord Buddha.The rest of the population embraces Islam,Christianity,Hinduism and other.There is absolute religious freedom. spoken by almost 100 percent of the Thai population is Thai.The Thai language has its own alphabet. It is tonal language.The other languages are Chinese and Malays .English is also well understood in most cities for visitors. unit is the baht.can divided into on hundred units called satang. Thai Temple Thailand is also a sacred bond. The priest, who is free from passion. To disciplines and activities Architecture is also a valuable cultural and stucco work. The painter and muralist Depicting Jataka tales and the various The high art To conserve Nurture and cherish It is a valuable cultural heritage. And visitors from around the world visiting popular. 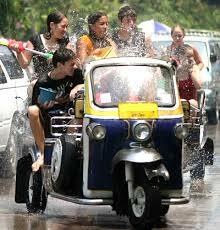 Songkran is a Sanskrit word meaning “moving” a metaphor for the movement of the mark in the universe. Is moving New Year’s faith in Thailand and some countries in Southeast Asia. Songkran is a ritual that takes place in the family. Community or neighborhood But the shift to wider society. And is likely to change attitudes and beliefs. Traditional beliefs in a symbolic element in the ceremony include the use of water as a substitute. Together with the definition of the summer. During the time when the sun moves into Aries. Use water to the skin. A prayer from adults Remembrance and gratitude to the deceased fathers. Modern society, the tradition back home in Thailand Songkran Festival. Songkran Festival is a family day The ceremony was to pour water that has brought prosperity. To start the New Year with joy. At present, the promotion of tourism as the Water Festival or the Festival of the cut, which is believed to be the original. – The merit Considered creating a charity for himself and wishes to those who passed away. This philanthropy is often prepared in advance. Bring food to monks at the temple. This is for philanthropy. Today, after the merits have done. It is a tradition with his sand. – Watering a New Year’s greeting to each other. Pouring water often use perfume laced with plain water. – To pour water to water the Buddha and the temple priest and some held with bathing. – Dmhaw purposes like watering the region. Seen in the north Dmhaw do to show our respect for the elderly, is to ask for the things that have been abused or New Year wishes from adults. The use of coconut, banana costume are mostly headed sompoi candles and flowers. – The release of birds, fish Baptism is considered made. To exorcise evil happiness comfort in the new year. Bringing sand to the temple Northern popularity Kntraiekgawad to foreshadow fortune. To happiness Gold Ood as carrying sand into the temple. But there are some who That year Bringing sand to stick out a foot as a sin is a sin not to Kntraiekgawad. – Festival North (Thai Lanna) or “Wild West nee New City” is unique since “the fairest day cruise” (13 April) a clean house to prosperity “Wannena” or “day. rotten “(14 April) that prohibited anyone abuses that bad because the bad luck throughout the year,” King day date “or” New year “(April 15) today, people will wake up early philanthropy. put a fair hearing Before pouring water defusing elders in the afternoon “at the mouth of the Year” (16 April), the villagers went to water the abbot of the temple to ask for respect. “The mouth of the Month” (April 17) a day, the villagers send various misfortunes. Out to end the festival, Lanna and “mouth day” (April 18). – Festival of NorthEast The most common are simple But a lot of warmth In the East it is called Songkran. “Five months of Merit” or “New Year Songkran” Some areas are known as “rotten” and is considered an auspicious day in the 15th lunar month, five o’clock in the afternoon a third time by the clergy to drum home the Open Era. The kith and kin to prepare for the perfume gathered at the temple for bathing Buddha. Then by pouring water grandparents and relatives. For the Malaga penalty, then it’s Songkran water splashing each other playfully. – Thai south The belief of traditional Songkran south. Songkran is a time of shifting keeper Angel horoscope house. They then take the first day of the festival (13 April) as “day old ruler” will do something bad to exorcise the “free day” (April 14) to the city. to monks at Wat And Bathing the Buddha And the last day “The day you get a new city” (15 April) will inaugurate the new Angel with Title IX beautifully celebrated the Songkran festival. – Central Festival Starting on April 13 is Maha Songkran Day on April 14 as a “day center” or “Wannena” and dated April 15, the third day of the New Year’s Day is a religious ceremony. Has merit Bird and fish Libation charity dedicated to deceased relatives to pour water Kntraiekgawad the sand pagoda. Loi Krathong(Thai: ลอยกระทง, IPA: [lɔːj kràʔ tʰoŋ]) is a festival celebrated annually throughout southwestern Tai cultures, (Thailand, Laos, Shan,Tanintharyi, Kelantan, Kedah and Xishuangbanna). The name could be translated as “to float a basket”, and comes from the tradition of makingkrathong or buoyant, decorated baskets, which are then floated on a river. Loi Krathong takes place on the evening of the full moon of the 12th month in the traditional Thai lunar calendar; hence, the exact date of the festival changes every year. In the Western calendar this usually falls in the month of November. In 2015 it was celebrated on November 25th; in 2016 it will be held on November 14th. According to the Royal Institute Dictionary 1999, loi (ลอย) means “to float”, while krathong (กระทง) has various meanings, one of which is “a basket to be floated on water in the Loi Krathongfestival”.Several translations of krathong are found, such as “floating crown”, “floating boat”, “floating decoration”. The traditional krathong are made from a slice of the trunk of a banana tree or a spider lily plant. Modern krathongs are more often made of bread or Styrofoam. A bread krathong will disintegrate after a few days and can be eaten by fish. Banana stalk krathong are also biodegradable, but Styrofoam krathongs are sometimes banned, as they pollute the rivers and may take years to decompose. A krathong is decorated with elaborately-folded banana leaves, incense sticks, and a candle. A small coin is sometimes included as an offering to the river spirits. On the night of the full moon, Thais launch their krathong on a river, canal or a pond, making a wish as they do so. The festival may originate from an ancient ritual paying respect to the water spirits. Government offices, corporations, and other organizations launch large decorated krathongs. There are competitions for the best such krathong. A beauty contest is a regular feature and fireworks have become common in recent years. Loi Krathong is often claimed to have begun in the Sukhothai by a court lady named Nopphamat. However, it is now known that the Nopphamat tale comes from a poem written in the early Bangkok period. According to H.M. King Rama IV, writing in 1863, it was a Brahmanical festival that was adapted by Thai Buddhists in Thailand to honor Buddha, Prince Siddhartha Gautama. The candle venerates the Buddha with light, while the krathong’s floating symbolizes letting go of all one’s hatred, anger, and defilements. People sometime cut their fingernails or hair and place the clippings on the krathong as a symbol of letting go of past transgressions and negative thoughts. Many ordinary Thai use the krathong to thank the Goddess of Water, Phra Mae Khongkha (Thai: พระแม่คงคา). The beauty contests that accompany the festival are known as “Nopphamat Queen Contests”. According to legend, Nang Nopphamat (Thai: นางนพมาศ; alternatively spelled as “Noppamas” or “Nopamas”) was a consort of the 13th centurySukhothai king Sri Indraditya (who is also known as Phra Ruang) and she had been the first to float a decorated raft.However, this is a new story which was invented during the first part of the 19th century. There is no evidence that a Nang Nopphamat ever existed. Instead, it is a matter of fact that a woman of this name was the leading character of a novel released at the end of the reign of King Rama III, around 1850 CE. Her character was written as guidance for all women who wished to become civil servants. Kelantan in Malaysia celebrates Loi Krathong similarly, especially in the Tumpat area. The ministry in charge of tourism inMalaysia recognises it as an attraction for tourists. Many people visit the celebration each year. During the festival, people also decorate their houses, gardens, and temples with khom fai (Thai: โคมไฟ), intricately shaped paper lanterns which take on different forms. Khom thue (Thai: โคมถือ) are lanterns which are carried around hanging from a stick, khom khwaen (Thai: โคมแขวน) are the hanging lanterns, and khom pariwat (Thai: โคมปริวรรต), which are placed at temples and which revolve due to the heat of the candle inside. The most elaborate Yi Peng celebrations can be seen in Chiang Mai, the ancient capital of the former Lanna kingdom, where now both Loi Krathong and Yi Peng are celebrated at the same time resulting in lights floating on the waters, lights hanging from trees/buildings or standing on walls, and lights floating in the sky. The tradition of Yi Peng was also adopted by certain parts of Laos during the 16th century. Rocket is traditionally one of the Northeast of Thailand to Laos. The legend of the folklore of the East title prince Kark. Ms. Oh’s Red Cliff In the New Folk mentioned above. The villagers held a rocket to worship the Lord God Elves or the material upon which the villagers believe that divinity. Lord elves are responsible for looking after the rains in their seasons. And a fire is very pleasing. If the village does not provide the organizers rocket worship. The rain will not fall in their seasons. May cause disaster to the village. In the event of Yasothon Rocket Festival is supported by the Tourism Authority of Thailand. PR Festival Known to the people of Thailand And abroad since 2515, which Yasothon Rocket Festival. Will be held on Saturday and Sunday of the second week. Every year in the month of May, in the event of Yasothon. It is also featured in the parade the day before the contest cheering on the marchers, including many rocket to rocket traditional procession. And traditional dance Sueng from the nine districts of the province attended the event also showed that the rockets in the past and present in Roi Et. Is distinguished for a unique and historic district, especially at Suvarnabhumi. The event features Every weekend in the first week of June every year. This is a Fireballs Gosh beautiful large (Lai Si Phum or pattern cutter), including a formation dance of the most beautiful part of the country, Phanom Pride is held every day of the 15th lunar month, 7 of every year according to the traditional. Heat Kong by two fourteen with the fireballs offerings. In most countries, each year there are tens of thousands of rockets, rocket rocket hundred million combined over 1000 and Stripes. According to current data, Sources have technicians in the preparation of rocket mastermind the most elegant font particularly Selaphum, Thawatchaburi district, the district may, Suvarnabhumi district, district Hturpaktrspiman etc., the camp fireballs. The point being made rocket Found many The Prime Phanom Roi Et, Yasothon Province Maha Chana Chai District and the province of Udon Thani and the other in the north east and so on. In addition, in the northern areas. There is a tradition of rocket Toei District Wichian Buri. Phetchaboon Bun Bang Fai great event. Without the support of Phetchabun Provincial Administration as well as the population in the area, mostly immigrants from the East in the decades before the South can also be found organizing rocket. In Sukhirin Narathiwat The amusement of the Northeast on Immigrants settling here since 2518 as the only area in the south of Thailand. The East has played this tradition. In addition, in the northern areas. Tradition also plays Rocket same. It is one of the traditions of Lanna. The belief is similar to the East is dedicated to Buddha and rain. This revolutionary technology is the wisdom of the ancient tribes of Thailand’s rocket for a rocket ancient history since prehistoric times. Cutting edge technology, the wisdom of the ethnic Tai invented more than 5,000 years before departing for a different tribes that aim to make the rockets. The tradition in the rain It appears from the evidence of the fireballs. Rainfall for use in traditional tribal Times. There is evidence to show the fireballs rain in Tai Lue, Tai – Tai Yuan Tai Puan East black tie, red tie, and much more. Traditionally, the fireballs of Tai Lue in Xishuangbanna that kingdom. Tai Lue traditional domiciled in Xishuangbanna region since prehistory. By evidence Since it Dynasty more than 3,000 years, so the rocket is the wisdom of the early history of the kingdom Lue Xishuangbanna in Yunnan province before emigrating to the States. Tai Lue is popularly known as fireballs. ** ** Fire up the purpose of the fire it up (blue) to worship Lord Indra or elves ask rainy season. This is done during the festival in the Tai Lue also said flower (fireworks) in such a celebration ceremony at the temple. Work preaching work Mahachat Katin Hulkฐin linen etc. The tradition of the fire, told the Times – Yuan of the Lanna Kingdom. Lady lecturer said that Tai – Tai Yuan City Times or thatch. Immigrants from the former independent kingdom. In Yunnan, more than 2,000 years ago established the kingdom Ionian city in the Mekong Delta, the point that power is an ancient tradition of tribal Tai – Yuan since Byzantine times the city more than 5,000 years before. emigrated to the Kingdom of the Ionian city, about 2000 years ago, Tai – Yuan called it lights up like Lue. And when I do, it will bring to light the ritual Buddhist temple called. The spoon-fed fireballs There are songs that tell Sueng fire. And a parade of lights to tell Sueng bone (left) says a fire at a tall bat higher up the ladder. In order to install lights at the high point will be sent to you lights up even higher. Current Tai – Yuan Long District Village. The point that the fire spread to inherit this tradition as old. The Bun Bang Fai Tai Northeastern kingdom of Lan Xang this. Tai Northeastern Tai Lao tribes have a history as old as “a class Coupe de la Marine” English professor. University of London Linguistic experts of Indochina said. Traditional tribal Times domiciled in the middle of China. 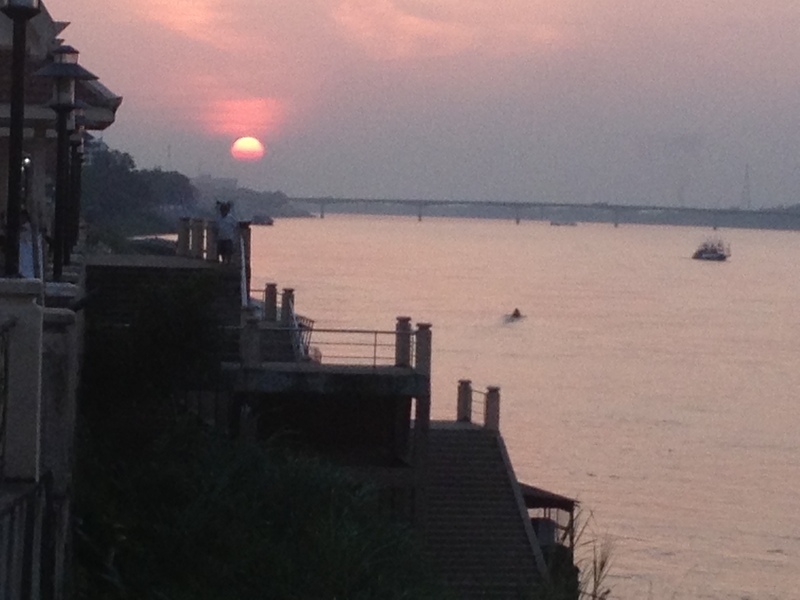 Between the Yellow River and Yangtze River. Valley region between Sichuan region with Shane C. (potassium site) without evidence of the empire, the independent city of Ai Lao people since 4200 years ago, the people of Ai Lao, which are the original inhabitants of China. Before the Han Chinese migrants from the north. The Bun Bang Fai traditional tribal Ai Lao. Before migrating to the Xang kingdom on the banks of the Mekong River. Northeast legend beliefs about the rocket. The ancient ritual since prehistoric times, such as the legendary ruler Kark. Oh, the legendary Dame Padaeng she traditionally marks the rockets will be made in six months. If rain does fall season. The Northeast is the fireballs to worship the Lord and alarm elves or welfare of the angels. (Angel of rain), like the sacred fire. To aspire to rain to rain in farming. In the Tai Puan kingdom of Lan Xang, it has traditionally been the fireballs as well. This is Tai Tai Puan immigrants from south of the city of Luang Prabang. Xieng Khouang Province, Laos since 2370 in the reign of the three settlements in several provinces. Maintaining the identity of the rocket is at Crescent Beach. District of Sukhothai province. Sukhothai Tai Puan is the fireballs on Vesak Day every year. To worship the prince of the elves to rainy season. Or to say that it was the spirit of the time, then farming. In addition, the Kingdom of the Tai Tai Chao twelve. Who once lived in the town before the historic moon. (Town water, cane rats) Region XII shall Times. Later, city water, cane rat drought. The immigrants settled in the City Palace in Vientiane. Until the reign of the third birthday of Vientiane, Lao rebellion. Thailand’s Department of Suppression Was forcibly Vientiane, including those of Thailand is right bank of Mekong River. In Udon Thani, Sakon Nakhon, Mukdahan and Kalasin. Bun Bang Fai early history of the Times. Hometown is a city of the moon. The twelve regional Times The unidentified legend Dame Red Cliff Mrs. Oh since ancient times. The purpose of the Bun Bang Fai is not only a ritual for rain and worship the prince of the elves. Also worship Buddha relics glass Chulamani Heavenly be done in six months. So let the rain keep falling planting seedlings. 2. Horse Bung Fai rocket This is a small point in the direction that defines a way of fixing the wire to the desired goal. Fireballs are a common feature that spawned one segment size as needed. In general, a diameter of about 2 inches long and about one foot to the central and east known as “biceps” like a horse that was running. What if the photo was called by a man riding a bull, but will do nothing. Sometimes known as the northern lights that fire. 3. Elephant Bungfai because elephant tail. Named as a light turban or sciatica. The time does not want to give up, but want to cry like carnivores. How to make the rockets used spawned the largest long-only protection only to have to close the two sides pounded bamboo provides little hole to fill for once, then detonated his sticks for hands made for when the batteries. 3-4 compressed into a small bamboo tightly. Cut the stick when it comes out like Lam. A bar about three inches of the large fireballs that most peripheral slate. Time splits will ignite the noise sounds like carnivores. Top put together a cylinder if needs be, how noisy it is in the technique of sounding it. 4.Bung Fai Sane a rocket-type rockets larger. Gunpowder heavy 120 kg or more. Fireballs hardest to do this requires special expertise. This is because if the rocket will be very dangerous. So before making fireballs ritual sacrifice must be made according to the principles of a rocket before you make them. When I finished, fireballs are adorned fireballs. 5. Bung Fai Ta Lai(Catherine Fire balls)This is Jim’s big enough. There are approximately 9-12 inches round with thin wooden flat circular cap when the rocket soared skyward by edgewise. 6. Bung Fai Tue(fireballs Metallica )Metallica rocket or rocket chipmunk sitting stump. A small rocket with a short tail cut bamboo to make a one-half inch long and about 3 inches when compressed between two fingers tightly around the charcoal when the charcoal three or four compression Thiet timber tightly. The tail is made of bamboo Cut into bars using a small saw to cut the corners out and see the rest. Drill a small hole, then next time to point out the tail fuse plug it into the dock port to be set. Detonated from the top The rockets are launched into the air and spin. Noise is rarely a dull time rotation direction. Use the funeral The time is very rarely done. 1.Som Tum Papaya is known to have in Thailand. Originated from the northeast of Thailand. You must be very tasty with grilled chicken. Hot rice and vegetables are delicious in many recipes such as Pour Tum marinade into Thailand. Thai Tum put the crabs and fish. And many others to try it. 2.Green Curry Chicken. 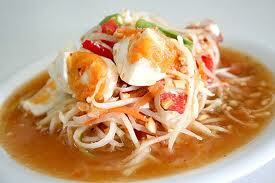 Thai flavors are concentrated, with steamed rice. What meal would not trade it. People with other food such as soup and grilled and fried foods would be ideal. Taken with different ears. The menu was not there since ancient Siam. 3.Kai Tom Kha soup is delicious food. The smell of coconut milk, broth and spices. Smooth taste. Boiled chicken is good. Tongue, soft flavor. Aromatic spice nose. I immediately took to the hungry. Eat with rice and vegetable curry’s not the nicest. 5.Massaman Curry Becoming a popular menu. The rank was to go for “Massaman Curry,” The Thai restaurant has been voted by the mass of mankind everywhere, the food deliciousthose rankings ultimately first in the world of the ranking of sites, CNN, in the end of the month. 50 July 2554 from the menu.When Massaman curry. Most of this is that many people who still think I can afford to eat well, but then I find my Massaman curry is easy to find out. The market (you lose) because it has a few shops. He is doing this kind of beef up sales. 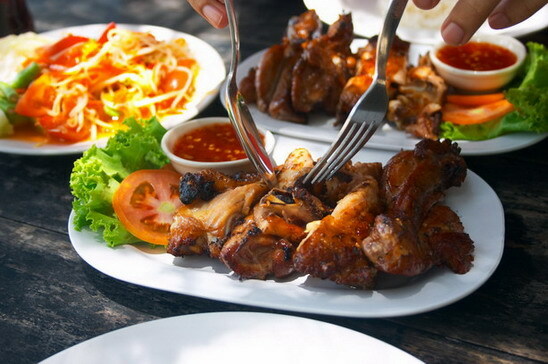 Most Thai food is the restaurant capital of Modern Times. generally takes a small puff of fire with egg Kuicheai chopped sprouts, radish, chopped tofu, yellow roasted peanuts and dried shrimp seasoned with chilies, fish sauce and sugar, served with lemon leaves Kuicheai sprouts and fresh banana blossom as a side. Thailand Thai fried pork somewhere to put down. Some may be used by municipalities over the sticky strips called “Stir the municipalities Thailand” or vermicelli called “noodle fried Thailand,” including fried chow mein Korat, Thailand is like eating a salad. There are also fried Thailand. By bringing all ingredients and stir to combine. Then comes wrapped in an omelette, fried Thailand later called “fried egg wrap Thailand” or some may be put shrimp instead of shrimp called “fried shrimp Thailand” Thailand shop usually sells fried turnip cake fried oysters or concurrently with. The ingredients used are numerous shared.